I got the same problem with my kit... I end up using xacto knife to clean the sides of the saddles a little bit and as Animoose I pushed the bearing in place with the vise and then used the drill press to enlarge a little the holes for the screws of the extruder stepper... I like how it end up working so I don't think there is the need to print it again until it's time for replacement of the bearings. If you want to upgrade the bearings search for igus RJM-01-08, they are on the $5 per piece price range but for what I have read that bushings are some of the best, the only detail that make me nervous about upgrading them it's possible problems because the rods don't being perfectly parallel as on some of the same posts that praise them there is mention of intolerance for deflection resulting on binding. Edited 1 time(s). Last edit at 10/18/2015 12:11AM by Mrfus. It all worked out, and despite a few problems I feel this is a good DIY kit. The reason I bought a kit was to really understand the inner workings, and so far I am not disappointed... It definitely takes some work to setup these things properly, and these kits are not for the mechanically disinclined. The build is complete, tomorrow I power it on for the first time, and do all the electrical adjustments...download the software, etc. Wish me luck! I agree with you 100% on the bushings. If your rods are not perfactly parallel to each other and perfactly streight the switch to bushings to bearings is not worth the trouble. One of my rods on the Y axis was .011 inch bend or warp in it I spent over 3 hours getting all of my rods to within .001 to being perfactly streight. The upper and lower support for the Z axis I did not like at all the upper plexiglass support the hole for the rod was not streight, the lower support you need to move 1.5mm offset to the outside to get proper alignment of the rod. All in all for me to use bushings at the origional assembly would have been a disaster. Now this is just my openion and I hope no one is offended but if you do not have perfactly streight rods, the unit assembled perfactly square and parallel don't waste your time and money on the bushings. This alignment also holds true to bearings but they are more tolerant. Look at your rods after using your machine for a while and see if you are showing any wear marks in spots this can be an indicator of a bend in a rod or not parallel. This is also a culprit of a noisy machine. I was told when I first got my machine by a person on this site to take my time and assemble it the best I can. I pass this along because it pays off in the long run. At the end it comes to the point that a machine from printed parts, general purpose components and being assembled on the kitchen table will be far from perfect, but with some patience and work the results can be impressive! Though you guys might like to see this. I am learning the ins and outs of support material. They weren't perfect for the helmet but they don't have to be. Some were a little thin and it took me awhile to figure out how to properly attach them at the base. Sorry I don't have shots of the helmet before I took the supports out. Pulling them off was a piece of cake. I may do this one again at half the letter height. This one was 0.2 mm. I continue to be amazed by this kit! I didn't go as crazy as you on the rods but I did take my time squaring things up when building. It did help. Like others said, you can definitely get up and running and make great prints. This is a great kit to learn on and get yourself oriented with 3d printing to improve and keep going. Here's my favorite. This one didn't need any supports. Happy Halloween! Thanks to alot of info I got from therippa and animoose and a few mods my machine is like therippa's, the loudest part of it is the power supply fan and all that gets hot is the bed and the hotend. In my openion this unit is the best bang for the buck. Before I had it mounted, the motor would typically run 135 F as measured with a surface pyrometer. Now with the fan running, after 1 1/2 hours of intense movement , it's staying at 90 F! That gives me some piece of mind. Im not sure what my X temp is. But its cool as a cucumber to the touch. Not sure why yours is getting so hot? I don't have my multi meter in the house so im not sure what the volt setting is on it. As a matter of fact its a different driver as I blew one when building the kit. so I bought a bunch online. I then adjusted it by sound. I would move the axis fast one way and adjust it until I got the motor to run as smooth and quite as possible. I did this to all axis's. 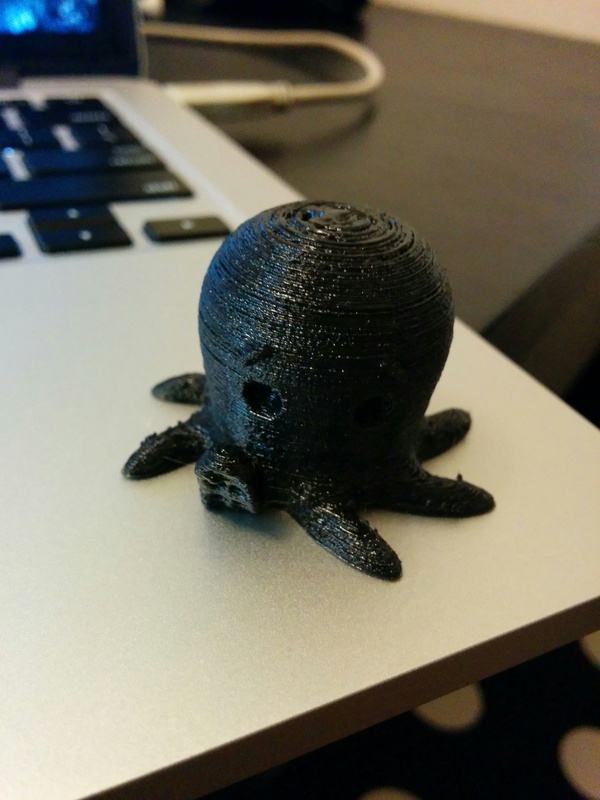 The only one that gets slightly hot is the extruder stepper. And that is only warm. Printer runs smooth and quite. Though I wish the fan on the power box ran less or was quieter. Im thinking about building from scratch right off (winter project) and maybe get a bigger power supply. Edited 1 time(s). Last edit at 10/18/2015 11:10PM by woodknack. Yeah, if your x-axis motor is too hot, you have your driver's voltage set too high. 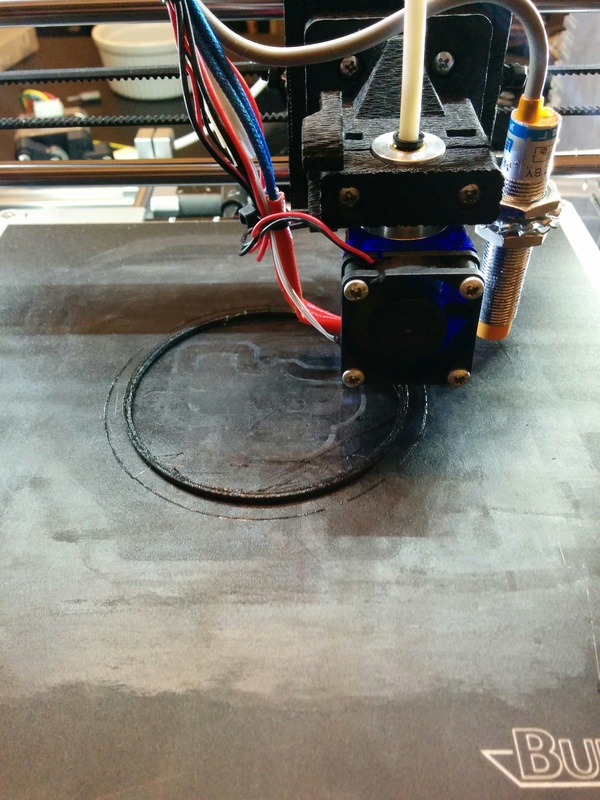 Also, anyone interested in seeing what it takes to print Ninjaflex with a bowden setup? Edited 1 time(s). Last edit at 10/19/2015 12:02AM by therippa. [attachment 64344 image.jpg][attachment 64345 image.jpg]Though you guys might like to see this. I am learning the ins and outs of support material. They weren't perfect for the helmet but they don't have to be. Some were a little thin and it took me awhile to figure out how to properly attach them at the base. Sorry I don't have shots of the helmet before I took the supports out. Pulling them off was a piece of cake. I may do this one again at half the letter height. This one was 0.2 mm. I continue to be amazed by this kit! I just got mine done this weekend,and I had a similar issue. I took an extra "L" bracket, and used it to keep the spool about 1" from the main frame, and another on the outside, leaving about 1/2" of play for the spool. With the filament fed through a supplied plastic loop (on the left Z motor as shown in the pictures) it worked fine. Edited 1 time(s). Last edit at 10/19/2015 02:58AM by Spam. Also want to thank all others that commented and gave advice...that is exactly what this thread is about... Hopefully I have contributed to that effort as well. Edited 1 time(s). Last edit at 10/19/2015 07:47AM by sonnylowe. My thoughts exactly EXCEPT the reference voltage on the driver is the lowest of all of them at 0.235 volts. And with the belt off, you can tilt the machine and the X carriage slides from side to side so there's no binding. The pot is almost all the way counter clockwise. Maybe it's just poor clearances in the motor itself although it is not noisy at all. I read many other comments in this thread about people with hot X motors, which is why I put the drawing on Thingiverse. I'm happily printing away so all is good. With a lot of help from you guys I finally got my Auto Tramming setup up and running on my printer. Here's a time-lapse video from Octopi...I'm still fine tuning but am very happy with the results so far...well worth all the hard work!! Edited 1 time(s). Last edit at 10/19/2015 12:18PM by Mrfus. I had the same issue. Let the good folks at Folger know and they will send a replacement. The crimp at the thermistor sleeve cut the thermistor lead on mine. I was actually able to solder them back together for a few days so I didn't have to wait for the replacement to get printing. Replaced it soon after I got the new one though as the connection wasn't the greatest. Common issue. Mine was broke too. What are the advantages of Ninjaflex? Edited 2 time(s). Last edit at 10/19/2015 07:12PM by sonnylowe. Hihihi... i was editing my original post while you were posting, yes the sleve broke the wire almost at the base i tried to solder but it's just too small to get a good solid weld. Right now I'm trying to carefully remove the shield so i can put it back on place when the new one arrive, I'm not surprised to the fact that got broken, the wire it's really small. It does work! I did a lot of research trying to find an extruder that can handle the filament, and this one was the best I could find. Only problem is it requires a stiff 7mmx30mm spring, but all I could find was a soft spring, and it was causing the gear to slip on ABS. I had a 7mmx20mm spring laying around from my old Folgertech extruder, so I remixed the part to the use it. I'm going to reprint this piece mirrored and rotate the motor direction, you'll see why when I post a pic of the installed extruder later. Happy enough with the results, I didn't expect to have it come out as clean as my ABS prints. 1. Because the extruder compresses the filament as it pushes it out, I lose about 10% of extruded length (when extruding 50mm of filament, I get ~45mm), so you'll have to up your extrusion multiplier in your host. 2. This stuff really doesn't want to start flowing until all of the previous is completely out of the extruder. Its melted viscosity made it difficult to push out the last bits of ABS, but it was eventually able to do it. 3. Since it's compressing inside the bowden tube, you need a decent amount of pressure behind it to get a good stream going when it's time to print. To fix this I print 7 skirt lines. Edited 2 time(s). Last edit at 10/19/2015 06:08PM by therippa.